Women's Modern Silver Necklace : LOVE2HAVE in the UK! A women's modern silver necklace. This necklace is a lovely modern piece of jewellery for women made entirely from solid sterling silver. It is bold in design but due to its sizing has a subtle feminine quality also. 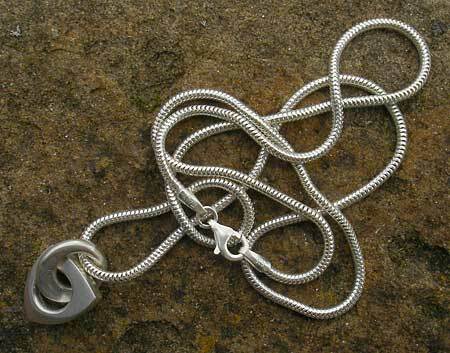 The pendant consists of two pieces, the first being an open jump ring looped through the chain. The jump ring has an off-centre eyelet and features smoothed edging inside and out. Threaded onto this is the squared off logo pendant with its angular shaping on its bottom edge. Again it is smoothed off. Together, these two parts measure approximately 15mm in height, and they come with a 16-inch slinky silver snake chain.